It is now only a few weeks until Lara's first birthday. And only a few weeks until our next big trip abroad. Inspired by a post on my Gumtree forum and by the forthcoming travels of Heather at Young Mummy, I have compiled a list of all of the things I feel are essential to pack when taking a summer holiday with a baby. Many of these items make the list as a result of our trip to France when Lara was barely three months old. Others are recommendations from friends, and from bloggers on my recent 'Flying Families' carnival. This should go without saying but before 6 months, babies shouldn't go out in direct summer sun uncovered, not even with the most powerful of sunscreen. After this they should have the highest SPF factor available and the sun cream should be topped up frequently. Make sure you try out your chosen brand before the holiday just in case there are any unpleasant skin reactions to the cream. Make sure you have lots of easily transportable toys and games to keep them entertained both during travel, and once you're at your destination. Take toys that they recognise and will associate with home but don't take the absolute favourite toy, just in case you leave it on a plane, or at a hotel by accident. It can be incredibly difficult to keep your little one out of the sun when you are on the move with the pushchair. We bought a UPF50+ Shade-A-Babe sunshade for the buggy which was absolutely vital for our trip to the sun. I the future, I'd look for a brand that was easier to fit and adjust but in general, it's great to have something that provides all-over protection, whatever direction the sun is coming from. With a baby who is big enough to be sharing your mealtimes, but who is too small to sit unaided in a chair, it is essential to take a travel highchair or booster seat with you because many hotels, villas, cottages and restaurants won't provide a highchair. We use the Totseat which I always carry in my changing bag. Many airlines will take a travel cot in addition to your luggage. Our travel cot is a Samsonite Pop-Up Bubble Cot and it is so light and so compact that we can put it into our suitcase. It is brilliant for taking with you when you have no idea what the sleeping arrangements may be but I don't think it is enormously comfortable for Lara as it rests on the floor and the mattress is quite thin. If you are (still) bottle feeding then it is a good idea to take all of the infant formula you need and not to rely on being able to purchase formula locally at your destination. Even the brands you know and trust may have different formula's abroad, so may not be to your baby's taste. In many cases you may not be able to buy the brand you want. When flying, it can be stressful taking boxes or powdered formula through security, but the hassle is worth it if you want to avoid having to feed a different brand to your baby. On a similar theme, if you are still sterilising bottles and cups then you need to think carefully about how you will do this abroad. In a villa or cottage you may have access to a microwave, so microwave steriliser bags may be the most convenient (and compact) option. In a hotel, you may need to use cold-water steriliser tablets such as Milton. If you are just travelling locally, or you have plenty luggage space, then you may want to take an electric steriliser with you. I cannot stress enough how important it is to take a compact, lightweight buggy on holiday. My travel system rocks but it takes up most of my car boot, is impractical for taking on a plane and is too precious to risk on airport carousels. My little Maclaren was bought for Lara when she was 3 months and is so much easier for travelling with, takes up less valuable luggage space, and copes surprisingly well with all terrains. Cut down on packing by taking a baby wash and shampoo in one, preferably one that moisturised your baby's skin too. We are planning on taking the Halos n Horns baby wash on holiday this year. In the absence of a beach hut or a UPF beach tent, a good sunhat with a wide brim and thick, natural, breathable fabric is a must. I've found that Lara tends to pull her hat off as soon as I put it on her so I have invested in a hat with a cord that ties around her neck. Green Baby do some great sunhats. ...taking your own baby linen. … packing a small number of co-ordinating clothes so that you can make several outfits from a few items of clothing (oh, and some hand-wash to clean them with). ...taking more than one swimming costume for your children (for when they won't dry fast enough, or if they are full of sand). 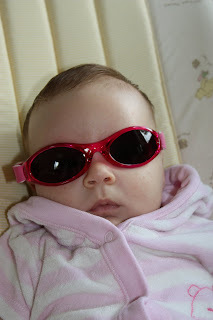 ...taking UVA/UVB protective clothing for when your little ones are trotting around in the sunshine.